Get excited you guys! It’s taco Tuesday and I actually have a new taco recipe to share with you. I have plenty of taco recipes on the blog, but I can never seem to get the timing right for sharing the recipe. 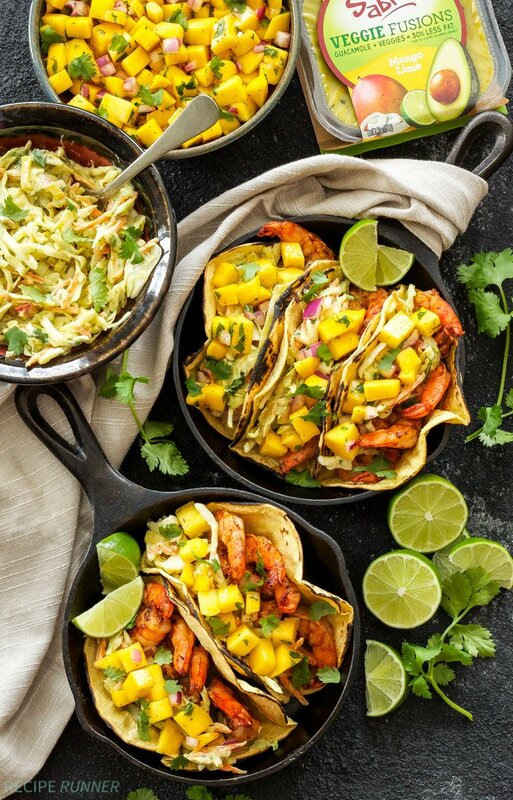 Lucky for you I got my act together and made these Grilled Shrimp Tacos with Avocado Slaw and Mango Salsa just in time for taco Tuesday! Everything about these tacos screams summer. 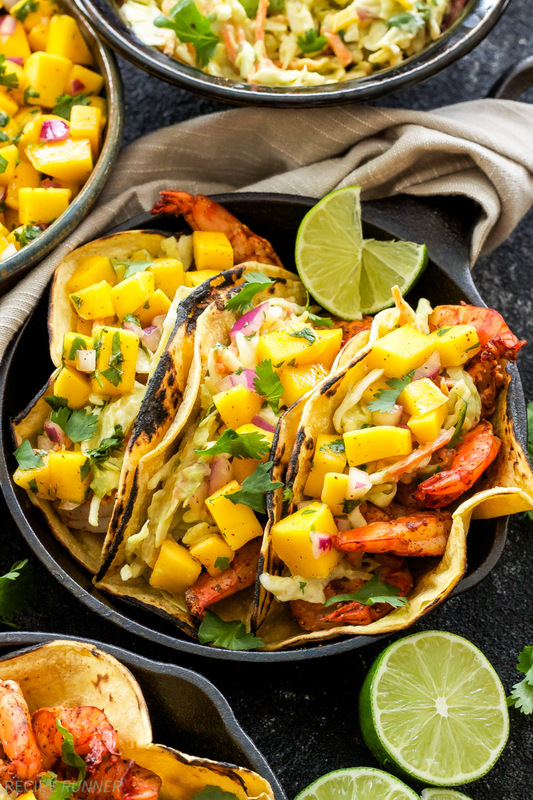 Grilling, shrimp, mangos, slaw, this is definitely a summer taco. 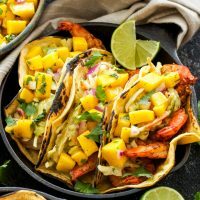 If you’ve been suffering through a heat wave like I have, then I bet one of these fresh, flavorful tacos with a tropical twist will help transport you from the miserable sweat induced coma you’ve been in, to an island paradise! Okay, maybe not, but it’s worth pretending. Anything to get your mind off of the miserable heat! When it comes to tacos my theory is 50% of the flavor should come from the filling and the other 50% should come from the toppings. 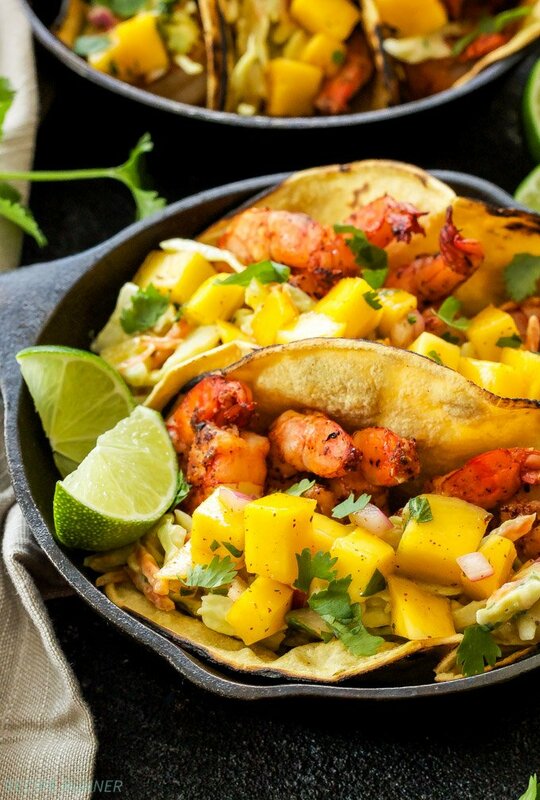 These Grilled Shrimp Tacos with Avocado Slaw and Mango Salsa have a good balance of both. The shrimp is seasoned with chili powder, smoked paprika, cumin, salt and pepper. The spices give the shrimp a great smokey flavor that’s enhanced even more when they’re grilled. I find that skewering the shrimp is the easiest way to grill them so they don’t fall between the grates. Now for those toppings! First, the avocado slaw. The great flavor for this creamy slaw comes from Sabra’s new Veggie Fusions Guacamole. 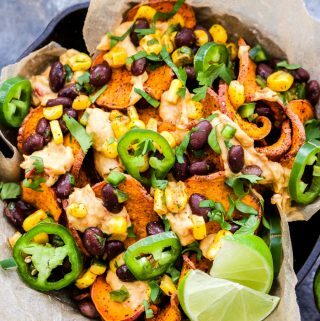 I used the Mango Lime version because it made the most sense since I was making a mango salsa, but it also comes in Garden Vegetable and South Western flavors. All three varieties are vegan, kosher, gluten-free and I love that they contain 30% less fat than a classic guacamole and are made with real vegetables. To add a little more creaminess to the slaw I combined the Veggie Fusions Guacamole with some Greek yogurt plus cilantro and lime juice for a little added freshness. While I could have stopped with the avocado slaw, I couldn’t resist finishing off these tacos with some fresh mango salsa! It’s the perfect tropical, sweet finish to these summer tacos! 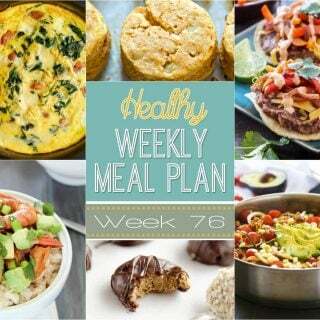 In a large bowl whisk together the Sabra Mango Lime Veggie Fusions Guacamole, Greek yogurt, lime juice, cilantro, salt and pepper. Add in the coleslaw mix and stir together until thoroughly coated. Cover and refrigerate until ready to serve. Combine all of the ingredients for the mango salsa together in a medium sized bowl and stir together until combined. Cover and refrigerate until ready to serve. Preheat grill to medium high and oil the grill grates. In a large bowl toss together the shrimp with the spices until coated then thread them onto skewers. Grill the shrimp for approximately 1 minute per side or until pink and starting the curl. Grill the corn tortillas until slightly charred and crisp around the edges. Place approximately 4 of the shrimp into each tortilla. Top with the avocado slaw and mango salsa and serve immediately. Thanks to Sabra for sponsoring this post. As always all opinions are my own. To learn more about Sabra Veggie Fusions Guacamole and get a $1 coupon visit www.sabra.com/veggiefusions. The slaw has me hooked! I never knew that Sabra made anything other than hummus! And they're gluten free, vegan and vegetarian! Win-win! Their new products they've been coming out with are great. I've tried so much Sabra stuff lately and there hasn't been anything that I haven't liked! Cant seme to find THE sabrá mango anywhere locally, What else can I use to substitute that? Hi Anabella. Bummer you can't find the Sabra mango lime veggie fusions in your area. You can just substitute it for any pre-made or homemade guacamole and it should work just fine. Enjoy the tacos! 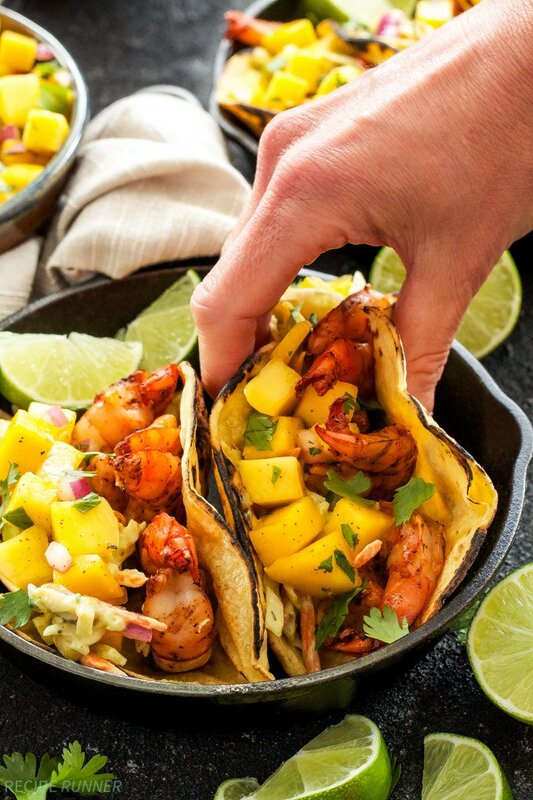 These grilled shrimp tacos look ahhmazing! Love that avocado mango salsa too! Tons of flavor happening here! These look like summer in a taco shell and I'm totally loving it. 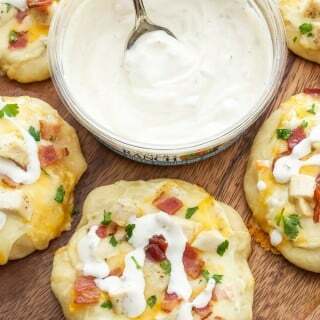 Cannot wait to give these a try!